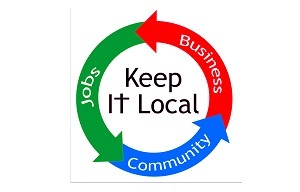 When you shop locally, the money you spend stays in the community. Buying a new pair of shoes from a local shop takes dollars out of your pocket and puts them into the pockets of a local resident, of course. What you might not consider is that those dollars get spent by the business owners as well, and they’re also likely to spend their money locally. Fun fact: The multiplier effect is why the government is still willing to make pennies, even though minting them costs more than one cent. The multiplier effect is powerful enough to justify all that loose change in the jar next to your bed, and it’s powerful enough to make shopping locally a force for change. You already know about the danger of greenhouse gases and the effects of global warming. If you don’t remember anything else, you probably remember Al Gore’s visual of a polar bear floating away. What’s easy to forget is that everything you buy had to come from somewhere. If you’re drinking imported spring water from Fiji, that water flew halfway around the world. If your new pants were made in China, they racked up frequent flyer miles, too. San Francisco started recognizing the historic contributions of local businesses by listing important shops on its historic registry. Looking around Bulloch County which businesses would you nominate for historic status? Check our Facebook and Twitter to see what other members have to say, and let us know any place we’ve missed. If you’re thinking about joining in with your own small business, check out our small business loans.